Shrule - Page 6 of 6 - Sruthair - "a river or stream"Shrule - Sruthair - "a river or stream"
Determination and the will to win are attributes which enhance any football team and Shrule certainly displayed these qualities when they emerged victorious after extra time over a gallant Carramore side in the final of the South Mayo Junior championship at Hollymount on Sunday. 1981 South Mayo Junior Championship winners. Back row : Jackie Walsh , M. Sheridan , Mattie Murphy , Tom Reilly , Ger Cawley , Eugene Murphy , Christy Cawley , Paul Greally . Front Row : Sean Frehan , J. Murphy, , Padraig Craddock , John Dowd , Tommy Sheridan , G. Craddock , Tom Gibbons . It was not a great game by any means but the fault did not altogether rest with the teams as the strong wind and lashing rain made a mockery of the best efforts of the players. Yet, it was a game that retained the interest of the spectators right to the final whistle as the fortunes of both sides swayed in the breeze before the long whistle heralded Shrule’s first title after a long list of unsuccessful attempts. Shrule were the pre-match favourites and lived up to their rating when they dominated the early exchanges particularly at midfield where Mickey Sheridan and Paul Greally gave their forwards as plentiful supply of the ball. Paul Greally and Tommy Sheridan pushed them into an early lead but if their forwards were a little more accurate Shrule could have opened up a gap by the end of the first quarter. Instead Carramore were just one point behind Roy Flynn having opened their account with a point in the ninth minute and Tom Maloney added another six minutes later. Both side missed chances before the interval at which stage the score stood Shrule 0-4, Carramore 0-3. Carramore were a different side after the resumption as they tore into Shrule and wiped out their lead inside a minute when Noel McNamara pointed after a Roy Flynn centre. Tom Maloney put them into the lead two minutes later with another. Shrule were now in serious trouble as their short passing game was getting nowhere against first-time football of the Carramore side. J.J. Costello extended the Carramore lead with a point in the seventeen minute and when Tom Maloney picked up a J.J. Costello centre to fire over another point two minutes later, the Cup seemed to be on its way to Carramore. It was not to be however, for Shrule mustered all their determination to stage a fight-back and the score they needed came in the twentieth minute. A harmless-looking centre from Tommy Sheridan was picked up by Ger Cawley and he blasted the ball to the net to put his side on level terms. This score injected a new spirit into the Shrule side as they suddenly got on top and forced Carramore to concede frees. It was from one of these that Shrule got their second goal when a long range shot by Sean Frehan was fielded by Terry Walshe with his back to the goal, He turned quickly and fired a right-footer to the corner send the Shrule supporters delirious. At long last it seemed that Shrule were about to lift the title as the final minutes ticked away. Carramore mounted one last attack and were awarded a free. J.J. Costello placed the ball and quickly realised that the Shrule backs were thinking of the celebrations later in the evening rather than defending their goal. He tapped the ball to Eamonn Campbell and he had the simplest of tasks in belting the ball to the net. The final whistle sounded with the kick-out and so to extra time. Shrule now play Ballycastle in the county semi-final at Knockmore on Sunday. Whether it was the shock of Carramore’s late equalising goal or the memories of four South finals that haunted Shrule they were a subdued side in the first periods of extra time. Carramore were in full control and went into the lead after six minutes through a Noel McNamara point. J.J. Costello picked off another two minutes later and Eamonn Campbell extended that lead to three points when his over-head kick went between the posts just before the short whistle. Tom Maloney collected a pass and pointed to leave Shrule four points in arrears. In a desperate bid to pull the game out of the fire Shrule introduced teenager Tony Mullen to the middle of the field and re-introduced Tom Gibbons to the attack. These changes had a big bearing on the outcome as Gibbons shot two points in the first five minutes of the half and Mullen got on top of the tiring Roy Flynn. Wing-back Sean Frehan had one of the best points of the game in the seventh minute when he scored from nearly forty yards out. Tom Gibbons put the sides level with a point from a free in the tenth minute and the same player sent the Shrule supporters wild when he shot the winner from a forty-five yards free in the closing minutes. Matty Murphy, Dominic Craddock, Sean Frehan, Paul Greally, Tom Gibbons when re-introduced , Tony Sheridan. Eugene Murphy and Tony Mullen were the stars of the Shrule side, while for Carramore Brendan Campbell, Tom Dixon, Richie Walshe, Martin O’Brien, J.J. Costello, Tom Maloney and Noel McNamara tried their utmost. Scorers: Shrule- T.Gibbons (0-4), G.Cawley and G.Walshe (1-0 each), T.Sheridan and P.Greally (0-2 each), S.Frehan (0-1). Published in the Western People 1981. Categories: GAA, Local Sport, News items. The email address for the Shrule Community Newsletter is shrulenews@shrule.com; the address is Shrule Community Newsletter c/o Information Hub, Shrule Community Centre, Shrule, Co. Mayo. 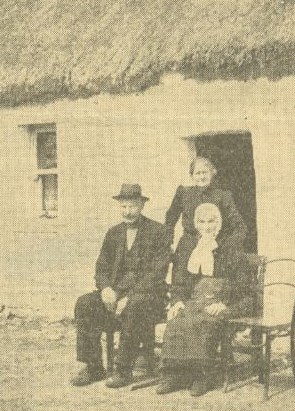 Mrs. Kate Murphy , Mochara , Shrule , Co.Mayo aged 104 years (seated on right) with her son,John Murphy aged 75 years and his wife ,Mrs. Margaret Murphy , aged 73 years all of whom are receiving the old age pension. Mrs Murphy who was born in the parish of Cong saw the terrible after effects of the Famine of 1847.She still can read without the aid of glasses.She was married almost 80 years ago .Her eldest son , aged 78 , is in the U.S.A. and is looking forward to a trip by air to Ireland to see his mother. Mr. B. BERMINGHAM, Dalgin, met Francis CREANE, Prospect, at 5 a.m. about four miles from Shrule. William BODKIN, Kilclooney, accompanied Mr. BERMINGHAM. BERMINGHAM fired, CREANE reserved this shot. The parties shook hands and left the field arm in arm. Original :: Tuam Herald – 8 June 1838 ? unconfirmed M.R. This strong construction was erected about 1238, and had an uneventful history down to 1570, when it was captured by Sir Edward Fitton and a strong British force, who on this trip took all the castles of Kilmaine. The De Burgos and McDonnells came to the rescue of Burke of Shrule, broke and pursued the English army, but the eventual outcome of the battle was doubtful. The Saxons kept the field, and with cajolery and treachery held it as far as the Kilmaine chiefs were concerned. Fitton himself was wounded. Wm. Burke occupied the castle, in 1574; John, his son, in 1610; Richard Burke, the Earl of Clanricarde, got the castle and lands to the extent of four quarters about this time, and leased them to Pierce Lynch of Galway.